You are not logged in. 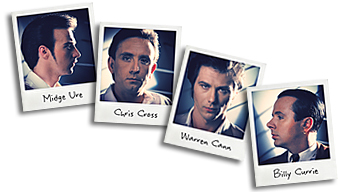 [Log In] Ultravox.org.uk » Forums » Music » Robin Simon » Happy New Year Robin! #67714 - Fri, 31 Dec 2004 18:04:00 Happy New Year Robin! I have forgotten the 'Quiet' side of Ultravox. Hope to hear again your strident guitar playing in an Ultravoxy scene. Happy New year to Kari too! Let's hit it Robin - "Systems of Romance Systems of Romance...."
#67715 - Wed, 05 Jan 2005 08:48:00 Re: Happy New Year Robin! Chris C ??? nah surely not the legendary Chris Cross?? in Gibralter, are all the Tax Exiles there on Main Street????? #67716 - Wed, 05 Jan 2005 17:34:00 Re: Happy New Year Robin! Not the legendary Chris Cross just Gib's Ultravox/John Foxx No.1 fan. Gibraltar is a small city and a large garden - very John Foxxy. There are 2 quaint Cathedrals here Sacred Heart and St Mary's. I'm sure that The Quiet Man has visited these.